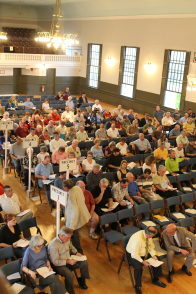 Have you always wanted to run for Town Meeting, but didn’t want to collect all those signatures? Well, there’s another way. This year Town Meeting has openings for 3-year, 2-year, and 1-year seats. You could run for one of them simply by asking voters in your precinct to write in your name and street address when they vote on April 2. To see the openings in each precinct, view the Sample Ballots. Each precinct has its own distinct ballot, which is a separate page in this file. Keep in mind that all precincts have 10 write-in spots for the full three-year terms. This means that the votes will go to the 10 folks who get the most votes, whether they are incumbents, new candidates, or write-ins. Ask registered voters who live in your precinct to vote for you by writing in your name. Focus on folks you know who are likely to vote. IMPORTANT!!! The Town Clerk respectfully requests that you do NOT give voters stickers to put on their ballots because the stickers jam the vote counting machines. Save your tax dollars! Ask voters to WRITE IN the names! Be sure that the voters know the correct spelling of your name and your street address. 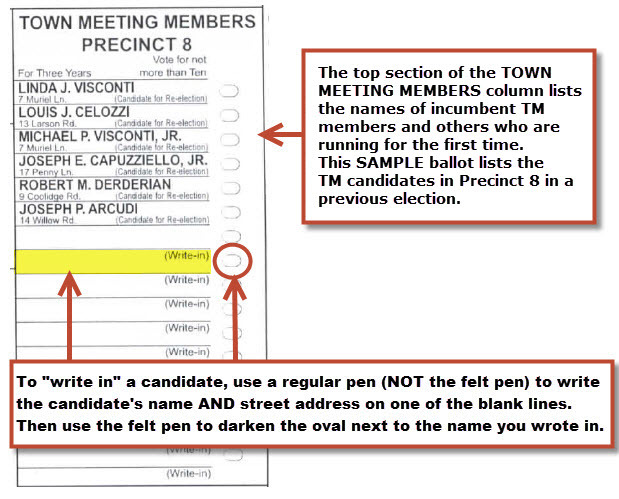 Explain to voters that to vote for you, all they need to do is write in your name and street address in the appropriate space for Town Meeting Members AND to fill in the oval at the end of the line. If the oval is not filled in, the vote does not count! Voters must use the marker provided in the voting booth to fill in the oval. See the illustration below. Tell voters to bring a ballpoint pen to use to write in your name and address because the write-in space is too small for the marker provided in the ballot box. To make this as easy as possible for your voters, give them a small slip of paper or a business card with your name and address typed on it. Be sure to tell them NOT to leave this at the polls. Simply suggest that they put the paper in their pocket or purse when they are done voting. It is OK to bring this into the ballot box; it is not OK to leave it there. Remember to vote for yourself on April 2! Before the election date, please call the Town Clerk’s office at (508) 634-2307 OR send an email to the Town Clerk at aneves@townofmilford.com to let her know you are running a write-in campaign. This will help the staff count the write-in votes more easily. Download a handout with instructions for running a write-in campaign.